This essay draws on a talk given at FPRI’s Miami Salon on December 6, 2018. China’s One Belt One Road (OBOR) project was late in coming to Latin America and the Caribbean (LAC). First announced by President Xi Jinping in 2013, OBOR, later renamed the Belt and Road Initiative (BRI), did not arrive in the LAC until 2018, when, at a meeting of the China-CELAC (Community of Latin America and the Caribbean) Chinese Foreign Minister Wang Yi claimed that BRI would “inject new energy into the China-CELAC comprehensive cooperative partnership and open up new prospects.” Given the impressive rise of the People’s Republic of China to the world’s second largest economy—first, by some measures—and the difficulties that many LAC countries were experiencing, it is hardly surprising that Wang’s offer was greeted with enthusiasm. If brought to completion, the integration of the LAC region into BRI would comprise 65 percent of the world’s population and 40 percent of global GDP. BRI is a breathtakingly ambitious program designed to underwrite the costs of global economic growth. As first explained, the road would revive the ancient Silk Route (albeit in re-imagined form) that passed through Central Asia, with an equally fanciful maritime route that extended to Southeast Asia and Africa. There is a good deal of creativity here: there were actually several routes through Central Asia. They had their heyday during the Mongol—i.e. non-Han Chinese—Yuan dynasty, and the name Silk Route/s itself was coined by German geographer Baron Ferdinand von Richthofen, who wrote of Seidenstrasse. Chinese merchants did indeed venture to Japan and Southeast Asia, but with the exception of the short-lived voyages of Zheng He (1405-1433), the country was basically an inward-focused continental power. By the time that the BRI reached LAC, the difficulties it created elsewhere had become well-known. In Malaysia, Prime Minister Mahathir Mohamad has accused his predecessor Najib Razak of complicity in a $15 billion dollar scheme involving deals with Chinese companies to construct infrastructure projects at wildly inflated prices. The Chinese Malay broker, Jho Lo, educated at Harrow and the Wharton School, is believed to be in hiding in China. Before failing to be re-elected, Najib had been conducting secret talks with the Chinese leadership to allow Chinese navy ships to dock at two Malaysian ports. When information began to leak, the Chinese offered to bug the homes and offices of Wall Street Journal reporters who were investigating the allegations. In Sri Lanka, the port of Hambantota has become the symbol for how China’s largesse can result in disaster. With only a one ship a day docking there and elephants trampling the port’s surrounding fences, the government was unable to pay back its loans and granted China a 99-year lease for debt relief. In Pakistan, the Imran Khan government is being investigated for awarding a BRI-related dam construction project to a consortium of a Chinese company and one founded by the prime minister’s adviser, after disqualifying another bid. Chinese nationals and Pakistani workers on the China-Pakistan Economic Corridor have been murdered, and there is controversy over the Chinese presence at the strategically important port of Gwadar. And in New York, Patrick Ho Chi-ping, a Hong Kong surgeon, is on trial for bribery charges related to his promotion of BRI. Marketing his scheme as “Globalization 2.0,” Ho was able to sign nearly $20 billion in deals in Africa, Russia, and the U.S., with the bribes being listed as charitable donations from a Virginia foundation that received its funding from Shanghai. China’s loans to Africa have been accused of encouraging dependency, utilizing corrupt deals, and endangering its natural resources. Kenya is in danger of losing its port at Mombasa to China if, as predicted, it defaults on loans. In Europe, there are concerns with Chinese management with the port of Piraeus in Greece, and with trainloads of goods entering Europe but returning to China empty (“one belt, one way” according to skeptics), thereby exacerbating the imbalance of trade. Under such circumstances, LAC leaders might be expected to be wary of joining the BRI. Yet, Wang’s initiative was eagerly received. In the words of one Latin American economist, much was promised, little was demanded. Initially, only a few countries formally declared their membership by signing memoranda of understanding (MOUs). Panama was the first, soon after it broke diplomatic ties with Taiwan in November 2017, but 14 others signed on subsequently, with the latest being Ecuador in December 2018. The majority are smaller countries in Central America and the Caribbean or members of the New Left: Venezuela, Bolivia, and Ecuador. Larger countries like Argentina, Brazil, Colombia, Mexico, and Peru have not yet signed on. Since little has been made public about the terms of the MOUs, it is difficult to assess the significance of accession to the BRI. Formal agreement is not a prerequisite for participation in the BRI or for receiving Chinese loans and attracting Chinese investment, but it has been hinted that Beijing would be more generous to those who do so. As a case in point, when the South Pacific kingdom of Tonga joined the BRI in late 2018, it received a five-year deferral on payment of a loan that China had given the kingdom several years before. Tonga is one of eight island nations in the South Pacific that owe significant debt to China, and repayment would have put significant strain on its resources. In the LAC case, a number of infrastructure projects undertaken with China had been in existence before the BRI was announced. Since they were in essence folded into the agreement, there are problems in determining what effect participation in BRI will have on the economies of the countries involved. Understandably, Chinese interests focus on projects that are of most value to the PRC’s own economy, meaning the extractive industries, foodstuffs, and Atlantic-to-Pacific infrastructure endeavors that will reduce the time and costs needed to transport these commodities to China and bring back Chinese goods for sale in the LAC. Infrastructure projects include track renewal for Argentina’s Belgrano-Cargas Railway, construction of the Bi-Oceanic Railway in Peru and Brazil, and the Tele Pires Dam in Brazil. In Chile, a trans-Pacific fiber optic cable that would connect China and Chile has been under consideration since 2015. Foreign Minister Roberto Ampuero sees this and other BRI projects as “increasing [Chile’s] status as an economic powerhouse in Latin America.” Backers hope that its completion will result in increased levels of general investment in Santiago. It is possible, however, that the undertaking will be adversely affected by the recent revelation that the Chinese telecommunications giant Huawei, which would construct the cable, has engaged in spying. A brief summary of developments in several of the larger countries in the LAC is illustrative of current trends. Brazil may be an example of Chinese clout indicating that resistance may be futile, so cooperation with the PRC is the only feasible alternative. During his campaign for the presidency, the outspoken Jair Bolsonaro showed hostility to China, saying most notably that China wasn’t buying from Brazil, it was buying up Brazil. However, a week after winning the contest, the president-elect met with the Chinese ambassador to Brasilia, sounding much more friendly. Describing China as “a great cooperation partner,” Bolsanaro said he welcomed Chinese investment and hoped that there would be more trade between the two countries. He had good reason to do so. Beijing has been quick to use economic warfare to deal with recalcitrant partners, as then-Argentine President Cristina Fernández de Kirchner discovered when her government filed anti-dumping charges against China in 2010. China then discovered quality control issues with Argentine soya, diverting its purchases to Brazil until Argentina withdrew the charges. Something similar could happen to Brazil. The PRC has been the country’s largest trading partner since 2009, indicating that a cessation of, or even slowdown in, trade would have serious consequences. Brazil’s exports to China in 2018 approached $50 billion, about twice what it earned from the United States. Since Bolsonaro’s administration has had a rocky start, help from China will seem attractive. Still, given Beijing’s interest in extractive industries, cooperation with the PRC seems likely to create more problems for him. China’s record on both the treatment of indigenous peoples and on environmental protection was already under fire before Bolsonaro assumed the presidency, with one focus of criticism being the aforementioned Tele Pires Dam. A group of 21 non-governmental organizations from Argentina, Brazil, Bolivia, Ecuador, and Peru recently filed three reports from their review of 18 projects managed by 15 Chinese business consortia. The group found a “systematic violation of the rights to prior consultation and participation alongside forced evictions, destruction of places of cultural and natural importance and the criminalization of community leaders.” Environmentalists are likewise concerned with destruction of the Amazon, which they describe as simultaneously a carbon sink, the Earth’s lungs, and a rainmaker for the planet. Sixty percent of the Amazon rain forest is in Brazil. Venezuela has become the LAC’s poster child for what can go wrong by accepting Chinese loans. After the country ran up a debt of over $70 billion dollars and spiraled into hyperinflation, Beijing cut back on further lending, with Venezuela’s oil output mortgaged to China to meet its obligations. In September, President Nicolas Maduro went to Beijing to plead for additional funds, which apparently were not forthcoming. The president agreed to sell an additional 9.9 percent stake to a Sino-Venezuelan joint venture to a Chinese state corporation which already controlled 40 percent, with oil services and procurement at the joint venture to be handled by Chinese companies. According to Reuters, it was unclear what Beijing was giving in return. Even more worrisome is the Maduro government’s collaboration with the huge Chinese telecom company ZTE on a system known as carnet de la patria, fatherland cards. The project involves more than technical assistance: a unit of ZTE is embedded within the Venezuelan telecom provider CANTV. ZTE is only in theory a private company, and has had various problems with the U.S, including being fined $1.19 billion for breaking sanctions by selling electronics to Iran and North Korea. The carnet is a national database that can set up payments for medicine, pensions, and food—but will also enable the government to keep track of dissidents and quash dissenting views. Domestically, there have been complaints about this infringement of privacy, while international business interests point out that the card will also give China a database not only on Venezuelan citizens, but also on foreign companies and their non-Venezuelan employees. At both the APEC summit and in meetings with leaders of Central American states, U.S. Vice President Mike Pence warned about debt diplomacy and debt traps, urging countries to avoid “a constricting belt or a one-way road” while requiring transparency in their commercial partnerships with other nations. Although Pence named no nations, the PRC Foreign Ministry spokesperson immediately rebutted that Washington was indiscreetly pinning labels on China to serve its own political needs at the expense of the well-being of the people in developing countries. There is nothing inherently wrong with the BRI: many countries might welcome cooperation with China as an opportunity to play the PRC off against traditional trading partners. BRI is also attractive since it carries potential for gain, both for individual leaders—several have been accused of corruption—and their countries. However, many appear to have given too little thought to the possible disadvantages. Like any other shrewd business entity, Beijing will portray its motives as altruistic while contributing to the benefit of all—a “win-win situation” is the standard phrase. As in any economic system, however, there will be winners and there will be losers. Despite Bolivia’s woes, its space agency reported that the country’s first communications satellite, Tupac Katari-1, earned $102 million in its first five years. TKSAT-1 was launched in China, and its personnel were trained there. And a Panamanian fruit export company was optimistic that its products would be enthusiastically received in the PRC. A Chinese professor at a U.S. university believes that many of the PRC’s problems in Latin America are caused by a lack of experience with environmental regulations and in dealing with NGOS and that they will be able to adjust to the more democratic setting there. Nonetheless, at least currently, problems seem to outweigh advantages. 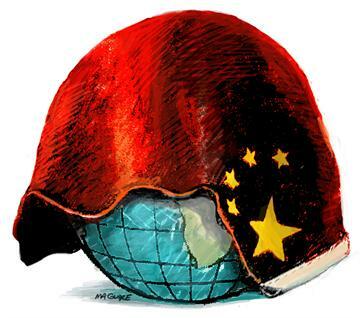 To concerns with the lack of transparency in agreements should be added the potential for de-industrialization: concentration on supplying the food and energy demands of the PRC has diverted attention from the industrialization that LAC countries have long pursued. Since Chinese-manufactured goods typically undercut the prices of domestically produced equivalents, there has been de-industrialization in some sectors and a decrease in inter-LAC trade in favor of trade with the PRC. It is also necessary to remember that what the PRC promises does not always materialize. Finally, it has proved impossible for the diverse countries of the LAC to speak with one voice with Beijing: as has been seen with purchases of Argentine soya being switched to Brazil after a trade spat, China can play one LAC state against another. June Teufel Dreyer is a Senior Fellow in FPRI’s Asia Program. She is Professor of Political Science at the University of Miami, Coral Gables, Florida. Author’s note: The PRC actually has many environmental regulations, though evasion in complying with them is widespread. NGOs also exist, but are under constant scrutiny and are closed down for seemingly minor reasons.